I decided to make stuffed cornish game hen one night because (1) I’ve never eaten hen, (2) I love stuffing, and (3) I love gravy. I combined two recipes, a honey glazed hen and a sausage stuffed hen, together to make the ultimate hens. For the stuffing, I actually used real toasted bread cubes and not the storebought pouches like I usually do. And for the gravy, drippings + chicken stock + flour = yum. Verdict? “Yeah, I like chicks….hens, that is.” 🙂 The hen was very moist and juicy – which would have been even more had I marinated it longer. The stuffing was cooked well. And the gravy, sooo good. Day before: Rinse hens, trim off excess fat, pat dry, and place in bowl. Combine all the ingredients for the marinade in a food processor or blender. Pour marinade over hens. Refrigerate overnight and turn hens in marinade (I only marinated for 4 hours on one side and it still came out well). Day of: Preheat oven to 375 degrees F. Brown sausage and combine stuffing ingredients together. 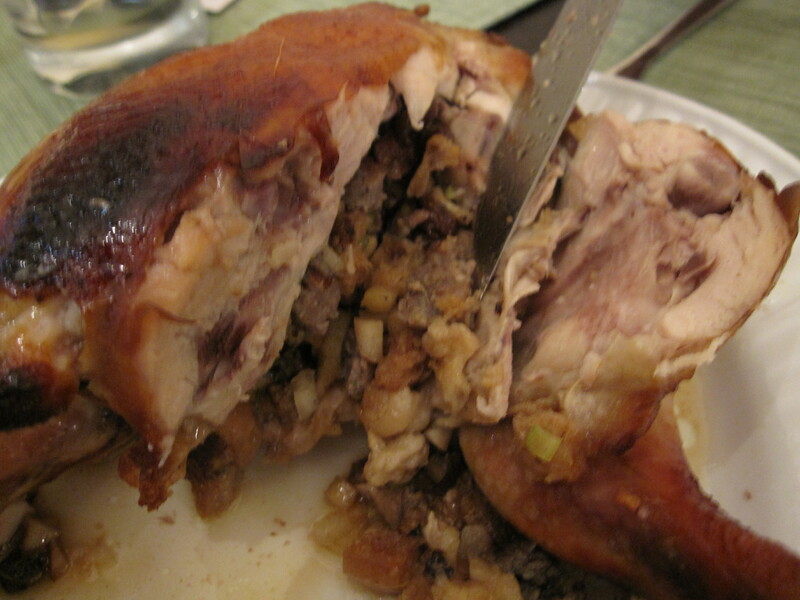 Remove hen the refrigerator and fill cavity with sausage stuffing. Close openings with string or skewers (I used metal shish kabob skewers, haha). Place hens in shallow roasting pan with rack (I may try this next time without the rack, but I tend to not like soggy meat). Pour half of the remaining marinade on top. Bake for 1 hour to 1 hour and 15 minutes, basting hens every 15-20 minutes. I placed aluminum foil over the hens after 25 minutes to avoid excessive browing (and potential burning). For the gravy, pour the juices into a small saucepan and whisk in 1/2 tablespoon of flour at a time until sauce thickens. 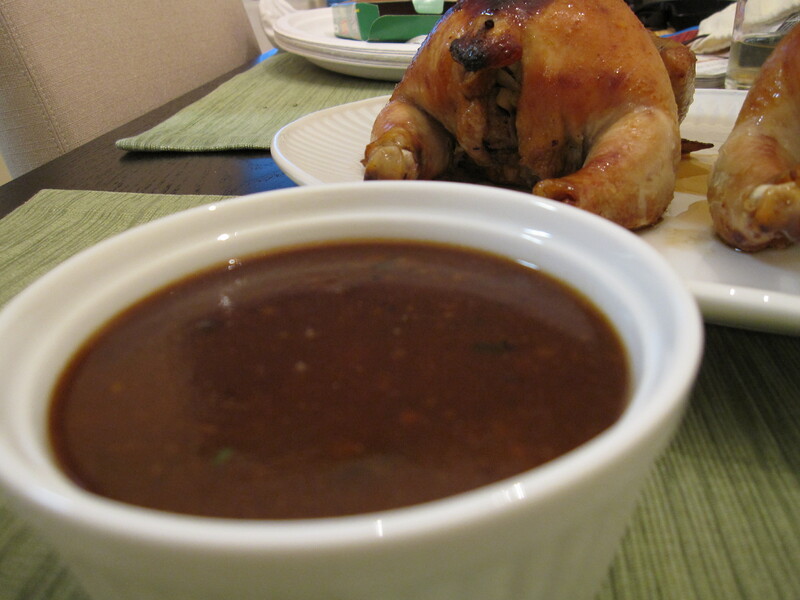 Serve gravy in a separate bowl or pour over hens before serving. 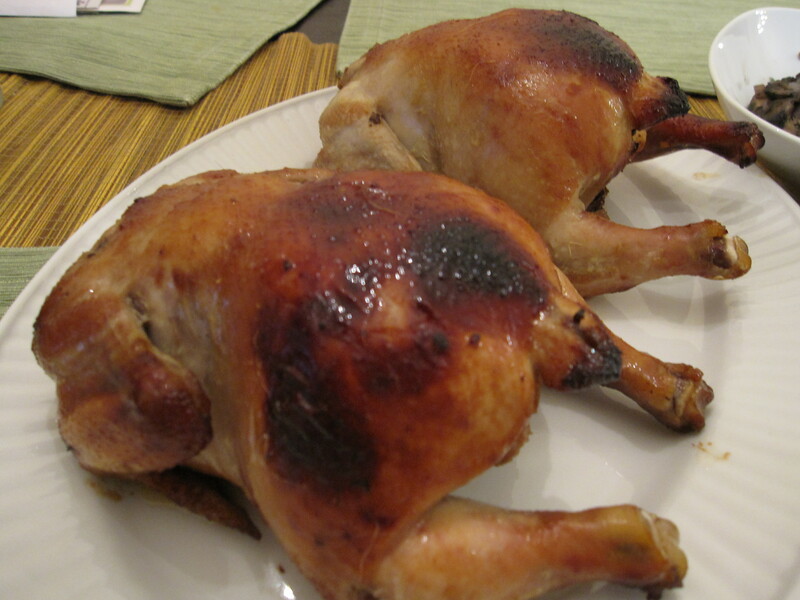 These chicks look juicy. Will definitely try this recipe out. You think 1 hen would be enough for 2 peeps?